As a single mom, most of my choices make my life easier. Reading this, you may think I’m an insane hippy mother who makes her own milk at home, but trust me: I am normal and I swear I’m doing this because it saves me time and money. If you’d like to know why I make my own cow’s milk alternative, scroll down to read the backstory and nutrition information. 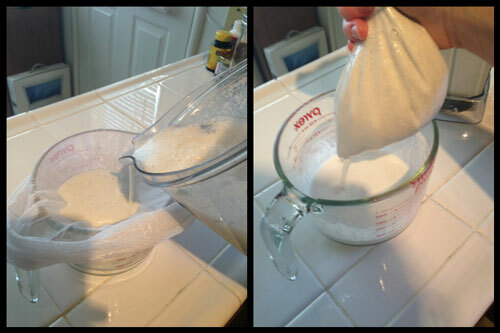 Pour the mixture into the nut milk bag, while holding it over the Pyrex. I now do this in the sink, which is cleaner, because there can be a little bit of spray when you squeeze the bag. Squeeze the liquid out of the bag. The liquid will strain into the Pyrex, and the pulp will stay in the bag. You can compost or throw away the pulp. Pour the milk into the bottle. Steps 5 & 6: Pour into milk bottle and enjoy! Now, for the backstory and nutrition information. I basically listen to everything my friend K says. When she tells me she’s made a decision, I know she’s researched the heck out of it. And that, my friends, is my little disclaimer about this post. I didn’t do the research, K did. But I trust her. C has intolerances to dairy, wheat, egg, and a sensitivity to soy. As some of my long-term friends and followers may recall, I discovered this when she was about three weeks old; it was part of the reason she had colic. K’s daughter also had a milk allergy, and her story is part of why I recognized what was happening with C.
I give my kids a combination of hemp milk mixed with coconut milk. Here’s why: Hemp milk is equal or superior to cow’s milk in every.single.vitamin and nutrient with the EXCEPTION of protein (more on this later.) There is also no cholesterol in hemp or coconut milk, and there is also much less sugar in both of these than in cow’s milk (cow’s milk has 13g of sugar in just one cup of milk. I thought maybe almond milk would have more protein, but no such luck. Cow’s milk has something like 8g of protein per cup, while hemp has 2g and coconut has 1g per cup. Almond milk also only had 1g. Go figure. Most adults get more protein than they need, but a lot of kids don’t like meat, so they don’t get as much or enough. Kids between the ages of 1-3 need 0.55g of protein per lb of body weight, so my kids need 13-15 (roughly) grams of protein per day. One large egg, 1/2 cup of beans, 2 Tbsp of nut butter, and 1 oz of cheese (which C can’t do) each have 6-8g of protein. Breads, some cereals, and some vegetables also have protein in them. The sole purpose of the coconut milk is to give them the same amount of saturated fat that is in whole milk, which is important for their growth. For about a year, I did the exact same thing, using the same brands. Then I came across an article about carrageenan, which is a thickener used in a lot of “health foods.” The article warned against the risks of carrageenan, citing studies indicating it may cause cancer. I checked our milk cartons, and sure enough, it was in both of them. Add that to the cost of the milk, and I wanted to find an alternative. I may be an alarmist, but I don’t care – better safe than sorry. 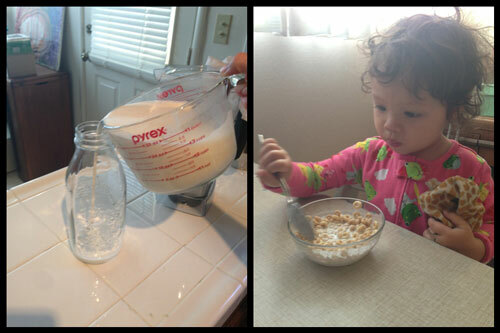 I now make C’s milk at home, and it seriously could not be easier. It takes less time than going to the store to pick up the packaged brands, costs less, and is healthier. 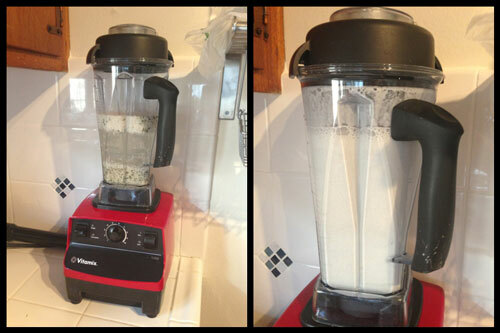 I use a Vitamix (seriously, worth every penny – I sold a piece of furniture to pay for mine, but I would have ferreted away money for it if I’d known how amazing it is), but another blender would probably work fine too. As you can see, I add two sweeteners to the milk. I tried it with just maple syrup, and C hated it. I am slowly decreasing the amount of both over time, hoping to have as little added sugar as possible. How long does the milk keep? And how often do you have to make it for C? My little one also cannot drink cows milk. Hey Stephanie! It keeps for 4-5 days, and I make it once or twice a week. 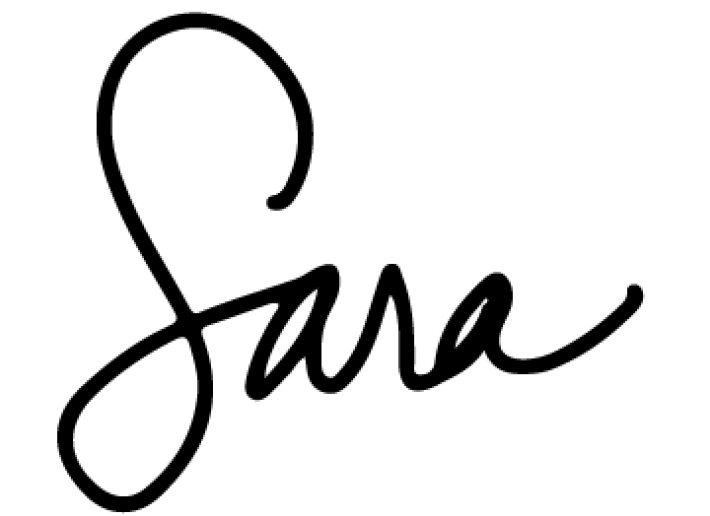 Hi Sarah, I am friends with Maritess and am on the same boat as you! My LO one may be dairy sensitive (he has eczema and is allergic to quite a few things including tree nuts). My question for u is—- Is the coconut/hemp milk lacking anything that cows milk provides besides vitamin D? Also, did you use organic hemp seeds? are they processed in a facility free of tree nuts? Hi Thuy! Honestly, I don’t know about the tree nut issue (I’m so sorry!). I haven’t looked at the information on the bulk bin at whole foods to see about contamination risk…I know there is a company called Hemp Hearts that packages hemp seeds. You might check their packaging or website to see if they’re safe. I do buy organic. Hemp milk actually does provide Vitamin D – it’s the protein you need to worry about. I hope that’s helped (a little?). One other question for you…. Do you know how many calories and how much nutrients are in the Hemp Coconut milk recipe? I havent been able to find out how much calcium etc is in 1/2 cup of Hemp Seeds. Hi Thuy! Sorry, I thought I responded to this! I’m not sure about the actually nutritional information. I give C a multivitamin to make sure she gets enough calcium.